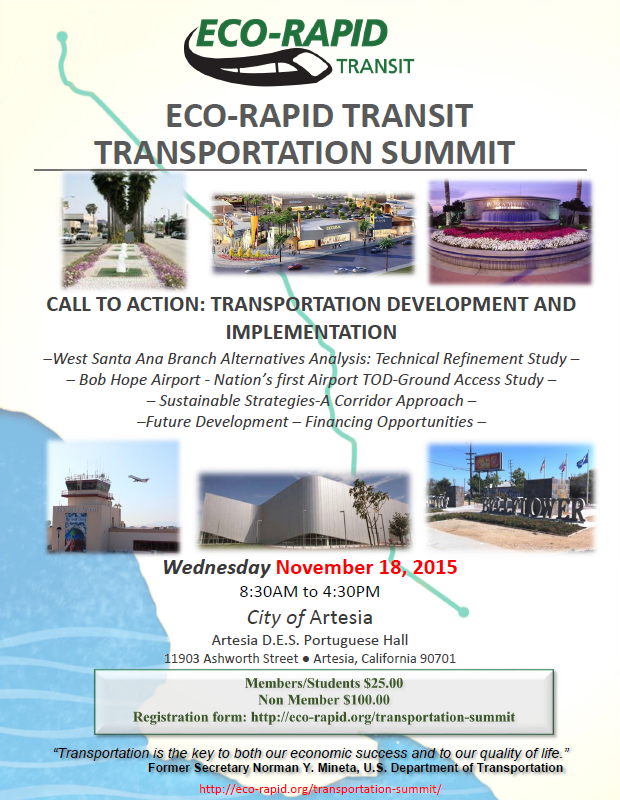 Building a sustainable and economically viable future through public transit will be the focus of more than 100 transportation and government officials at the first annual Eco-Rapid Transit Transportation Summit on November 18. This summit will be a catalyst for transit-oriented development and the creation of sustainable infrastructure in the Gateway Cities region of southern California. Join distinguished speakers including State Treasurer John Chiang, State Senator Tony Mendoza, Therese McMillan (Acting Federal Transit Administrator), Hasan Ikhrata, (Executive Director of SCAG), Diane DuBois (Metro Board Director) Ali Saleh (Gateway Cities COG President) and Phil Washington (Metro CEO). Gil Penalosa, CEO of 8-80 Cities and creator of Ciclovia in Bogota will be delivering the keynote address: Creating vibrant cities and healthy communities for everyone. Eco-Rapid Transit, formerly known as the Orangeline Development Authority, is a joint powers authority (JPA) created to pursue development of a transit system that moves as rapidly as possible, uses grade separation as appropriate, and is environmentally friendly and energy efficient. Parking/Transit Information: The venue is accessible via Metro bus lines.